A couple years ago I desperately wanted to get rabbits. My husband most certainly did not want rabbits. So I built a nest box for rabbits. Just in case we needed them. Just in case. That nest box kicked around the chicken coop for a little, until surprise! We got rabbits. My poor husband. Lol. It didn’t take long for the rabbits to chew that little DIY nest box from scrap lumber to pieces. The wire I stapled to the bottom fell completely out, and honestly, the chickens never liked it either. Once the DIY nest box went to the rabbits we tried a few different things for the chickens. First it was five gallon buckets laid on their side. Nope. Never once found an egg in one of those. Then we built some squares that mounted to the coop wall to save floor space. Those were okay. The chickens used them, most of the time. But honestly, they were a PAIN to clean. And if you’ve ever had a skunk get into your coop and break open the eggs to eat, believe me, you’ll WANT TO CLEAN THEM. Also, for some reason the chickens loved to roost on TOP of the nest boxes, which also gets really messy, really fast. The chickens decided that the goat manger was by far a superior laying spot, which meant the goats were whining because the chickens had “contaminated” their hay, and that I kept finding broken eggs on the ground where they rolled out of the slats before I could collect them. Not the best spot in my tastes. 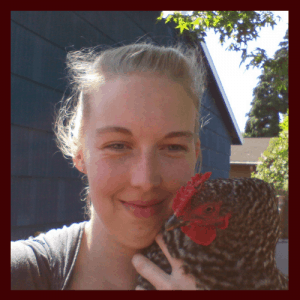 I had to lure them back into the coop with the best nest box ever, something that was cleanable, soft, and as awesome to a chicken as the goat manger. 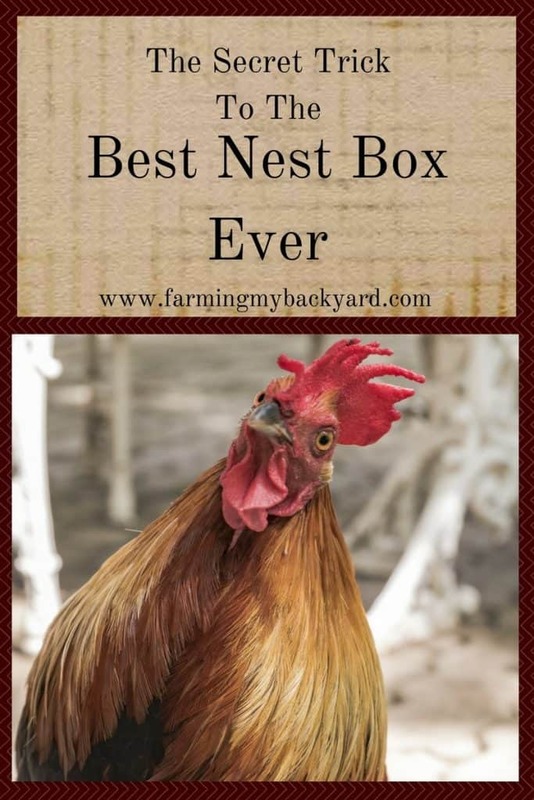 The Secret Trick To The Best Nest Box Ever! While I was failing to find the perfect chicken nest box, my rabbits weren’t faring much better. Not only did they chew the plywood to pieces, but that first nest box was too small. The front wasn’t tall enough and the babies could just roll right out, and the sides weren’t high enough to let the mother rabbit comfortably fit inside to nurse her babies. If your rabbit doesn’t like her nest box, she won’t even use it, which can cause the babies to get too cold and die. By far, the best nest boxes ever are plastic cat litter boxes! They are super easy to sanitize and clean. My rabbits always chew their wood chew sticks before going for anything plastic. If your chickens really want a private area, just use a covered litter box! Did they sit on the top and poop on it? No problem, just hose it off! Egg break inside? Bam, bleach that sucker. Too cold outside for your baby rabbits? Pick up that whole pan and bring the entire nest inside and it doesn’t drip hay and fluff through the bottom! Put some soft grass hay in there, and your chickens and rabbits will thank you for the clean, cozy, and colorful nest box. 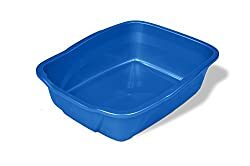 You will thank yourself every time you soak that thing clean, and every day that you’re not out hunting for eggs in crazy locations, or in a less than sanitary wooden box. The University of Nebraska extension instructions for building your own nesting boxes out of scrap lumber. How-to raise rabbits and gardens! good survival skills 4 the 7 generations ! PS Feed NO Corn to rabbits, nor SOY. Other rabbit foods, LITTLE BITS not treats in cage all time. Not every day! Comfrey can be fed fresh picked only …via Bill Mollison himself in my ear. Strawberry leaves are a favorite fed fresh. Organic carrots -1 slice per each POUND the rabbit weighs!!! not more than 2 x a WEEK as tops of carrots and swiss chard can easily kill rabbits if too much at once. It’s the OXALIC Acid, so…. Please do not “befriend” rabbits by feeding them! They eat PLASTIC and will eat things that are very harmful for them. Let them eat alone, and cuddle them alone without food.